Villeroy & Boch Ginger Village Tableware Collection is Here! I was recently at the Villeroy & Boch fine china boutique and they were starting to setup their Christmas displays and I spotted the MOST adorable Gingerbread Houses decorations. 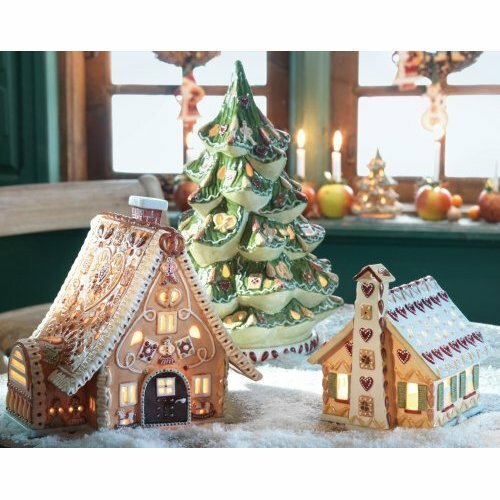 These Gingerbread Houses are part of the new 2009 Villeroy & Boch Ginger Village Tableware Collection and consist of the Pretzel House, Heart House, Witch’s House, and Almond House all display decorative icing and nuts so realistic they look good enough to eat! A tea candle placed inside illuminates a house beautifully at night. One house alone brightens a table or corner, while all four may be arranged in an enchanting village setting. Two green porcelain trees in different sizes add ambience. Villeroy & Boch creates gorgeous dinnerware and their Holiday pieces are truly exquisite works of art. These are certainly going on my “Christmas Wish List” You can find items here.